Andrew is desperately ashamed of his hoarder father, and Eddie is embarrassed by his lack of education - secrets that could pull them apart even as a friend's tragedy brings them together. When Andrew's father's condition deteriorates and he nearly dies because of his compulsion, Eddie and Andrew must learn compassion begins with loving oneself because Grime Doesn't Pay. It's like reading an episode of hoarders! 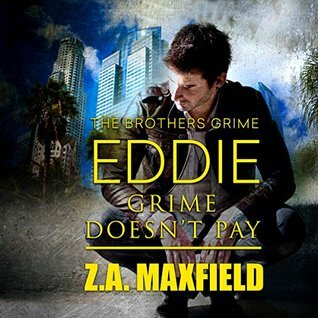 'Eddie: Grime Doesn't Pay' is the second book in Z.A. Maxfield's series 'The Grime Brothers' and while I enjoyed it. It didn't quite match the first book for me. I really, really liked Eddie. Interestingly Eddie rhymes with teddy and that's what Eddie was he was just a total teddy bear and really, really good guy. I liked Eddie a lot. Eddie's one of Jack's partners at 'The Grime Brothers' and he's a really solid guy. Eddie works hard, he's a good friend and as his integrity is rock solid but he's also considerate and honest...in short Eddie's a keeper and it seems that Andrew wants to keep him. Andrew's a school teacher and he's had Eddie on his radar since the first day Eddie brought his niece to school. I have to admit I never quite warmed up to Andrew. I found Andrew to be at times overly controlling and at times just downright obtuse....especially where his father is concerned. I liked the way that Eddie's dyslexia was handled in this story. While Eddie's dyslexia is indicated as being one of the more serious types. While Eddie has worked hard to enable himself to be highly functional and independent he still struggles with his self esteem because he has dyslexia. Ironically it was being dyslexic that also contributed to Eddie's compassion. At the end of it all I just didn't feel the connection between Eddie and Andrew as strongly as I did between Jack and Ryan. We are once again given a series where we get a new pairing with each book but we also get to see couples from previous books since the core characters in this series are friends and so far also co-workers. It's been a while since this story was first released back in 2013 and I have to admit now that I've had the opportunity to experience these first two stories there's definitely at least one more story that I'd love to read and that's Dave and Gabe's story, because there's totally a story there. We first met both of these men in Jack's book and again here in this book and and I know for sure that the more I learn about these two...the more I want a story. I know it's been 4 years but a girl can hope, right? One last note...'Jack' was my first time listening to Joe Arden who was the narrator for both of these books and I enjoyed the audio experience. The narration was solid. The character voices were solid and consistent, providing depth to the characters and I'm looking forward to enjoying other books narrated by this narrator in the future.